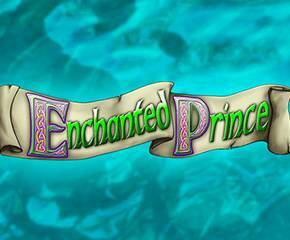 Eyecon is responsible for this fairy-tale themed video slot named Enchanted Prince. It is a story of a Prince that was turned into a frog by a wicked witch. He waits to be turned back to his true form by the kiss from one true love. An interesting story that is matched by an equally exciting gameplay and a Free Spins bonus feature. Read on to learn more about this enchanting video slot. 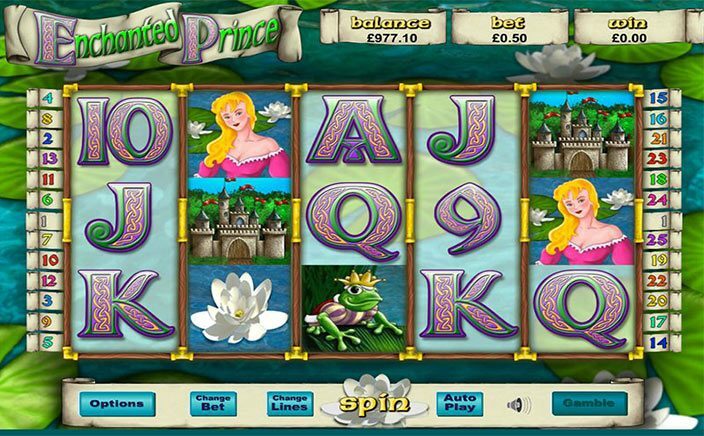 As mentioned earlier, Enchanted Prince is a fairy-tale themed slot. In the backdrop, you have a picturesque pond where the handsome prince/frog resides. This is where his true love will have to kiss him as a frog to break the curse. This slot comes with 5 reels and 25 active paylines with A, Q, J, K, 9 and 10 playing card low-value symbols on the reels. There are also the lily pad, castle, white flower and gemstone high-value symbols on the reels. You can earn as much as 800 coins when you land five of either the lily pad or white flower on an active payline. 1,400 coins can also be earned when you land 5 of the gemstone symbol on an active payline. Landing five castle symbols on an active payline will earn you 1,800 coins. The Princess symbol offers the highest reward. If you land five of the princess icons on an active payline you earn 2,400 coins. You start off Enchanted Prince by placing bets. The minimum bet allowed is 25p, making this game a good choice for low stake players. Once you have set your betting amount with the plus or minus button on the paytable below the reels you can start spinning the reels by clicking on the ‘Spin’ button. If you want the game to automatically spin the reels for a certain number of spins without interruption, you can use the ‘Autoplay’ button. This video slot has an Ornate Crown as the Wild symbol which substitutes other symbols on the reels apart from the Frog Scatter icon. The wild involved in a winning combination will earn you a 2x multiplier. You can activate the free spins bonus feature when you land at least three Frog Scatter icons in view on the reels. This will earn you 15 free spins, with 4 scatters you will get 20 free spins and with 5 scatters you will get 25 free spins. There is a chance you can earn 400 free spins in this round as it can be retriggered and each winning combination could get you a multiplier of between 5 and 50x your staked sum. This is a truly enchanting video slot with great prospects for players to earn massive payouts. The free spins are especially interesting and players can receive as many as 400 free spins as well as earn a win multiplier reaching 50x their staked amount. Enchanted Prince is one game that is worth checking out today.